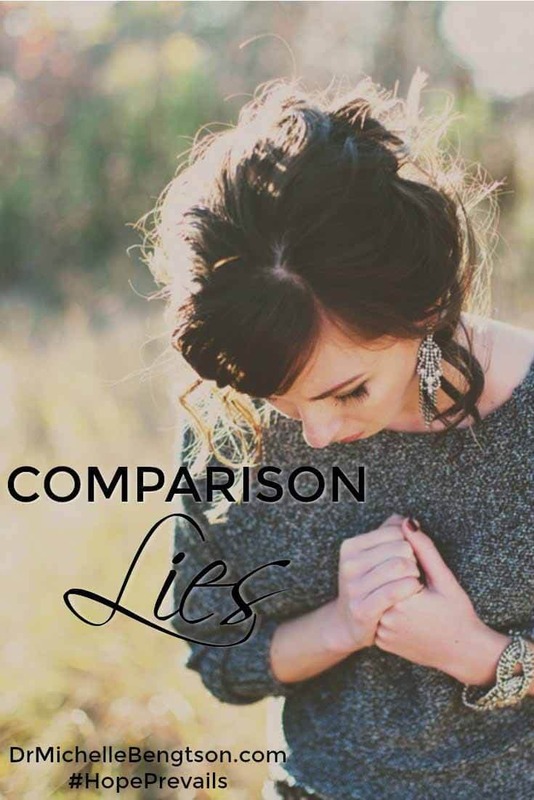 Comparison is something I’ve wrestled with my entire life–from childhood until now. In all areas of my life–educations, athletics, appearance, and writing. It’s held me back, fed my insecurities, and even eroded my own joy. But Michelle’s wise and encouraging words gave me hope as she leveled the playing field for everyone, negating the need to compare. I sat with my back pinned against the back of the upright chair, legs crossed, assessing my choice of attire for the evening from the boots to the pants to the lace blouse, and finished off with the jewelry—never leave home without it. Was my choice appropriate for the evening? It seemed to blend in sufficiently with Executive Ellen’s and Powerhouse Pam’s attire. I didn’t mean to, but I was in comparison mode. Oh how I hated that—I always ended up on the short end of the stick. I spent the evening planning an upcoming event with other area ministry leaders, honored to be included but secretly wondering how I made the guest list. It wasn’t so much what I wore on the outside that I was comparing with the others, if I was honest with myself. These were high-powered ministry women with years of successful ministry behind them that were more impressive than most ministry leaders I personally knew. Their impact for the kingdom was mighty. They each knew their call and they confidently lived and breathed it each day for decades. As I sat listening to their suggestions for the event, and adding my thoughts when warranted, I fought to ignore another deafening voice. One that sought to mock me at every turn. By the time the evening was over, I couldn’t get to my car fast enough. Thankful that dark skies fell early during these months, tears cascaded down my cheeks and no one could see them through my windows. I’m not even sure how I saw through my tears to drive home that night, but by the time I arrived in my garage, I turned off the ignition, sat in the solitude of my parked car and wept. Could it be true, Lord? That you don’t trust me to have a significant impact for the Kingdom? Just the thought of it grieved my heart. All I wanted was for others to see Jesus in me. To want to know Him. The evening left me feeling useless. Minimized. De-valued. Unworthy. A friend later asked about my evening and without going into too much detail (how could I? It was too embarrassing to admit my limited value), I shared my concerns of my seemingly limited contribution to God’s kingdom. She encouraged me to pray and ask God what He thought. Before I could stop myself, I admitted that I was afraid of His answer. Still, these thoughts stemming from my comparison game plagued me for days. I cried, I prayed, I searched the Scripture. I needed resolution. Tears flowed as I let those words seep into my heart. I had been listening to the negative lies of the enemy: You’re useless. You’re not trustworthy. God doesn’t value you as much as the others. Your purpose isn’t as important. No wonder I felt discouraged. 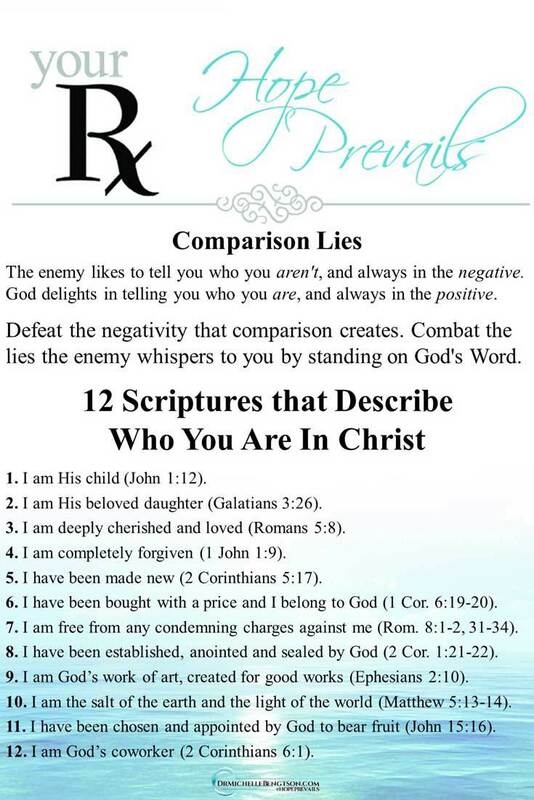 I knew the only way to combat those negative lies, was with God’s truth. 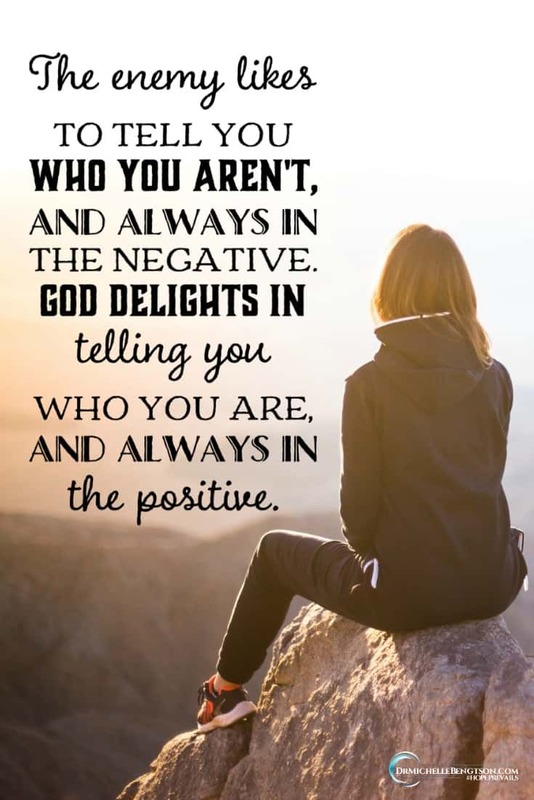 What does God say about me, and you? I am His child (John 1:12). I am His beloved daughter (Galatians 3:26). I am deeply cherished and loved (Romans 5:8). I am completely forgiven (1 John 1:9). I have been made new (2 Corinthians 5:17). I am free from any condemning charges against me (Romans 8:1-2, 31-34). I have been established, anointed and sealed by God (2 Corinthians 1:21-22). I am God’s work of art, created for good works (Ephesians 2:10). I am the salt of the earth and the light of the world (Matthew 5:13-14). I have been chosen and appointed by God to bear fruit (John 15:16). I am God’s coworker (2 Corinthians 6:1). Later in the week the Lord whispered to my heart that the value of anything is determined by what anyone is willing to pay for it. God was willing to pay for me with the cost of His very own son’s life. And He didn’t pay any more for any of those other women in the room whom I deemed more valuable or more worthy or more important to Him or the kingdom than I was. He paid the same price for each of us. God paid for me with the cost of His very own son’s life. He paid the same price for each of us. I have a purpose and a plan for you, and it is GOOD. He paid the same price for me as He did for you. That levels the field. There’s no need to compare. God paid the same price for me as He did for you. That levels the field. He knows the plans He has for me and they are good. Likewise, He knows the plans He has for you, and they are equally good. Let’s stop playing the enemy’s comparison game and start living in our Christ-bought identity. There is eternal security there. Let’s stop playing the enemy’s comparison game and start living in our Christ-bought identity. Jeanne, I think most people struggle with this (whether they will admit it or not). The very best thing we can do is know who we are and whose we are, by being in the Word and knowing exactly what God says. And it behooves us to surround ourselves with those who will speak life into us, and who we can encourage with truth. (And I too love spending some time drinking in Ephesians). Thanks so much for your consistent support. I am studying and writing on Ephesians too. The richness of chapter one—WHOSE we are and WHO we are in Christ blows me away. “A gift so no one can boast”. 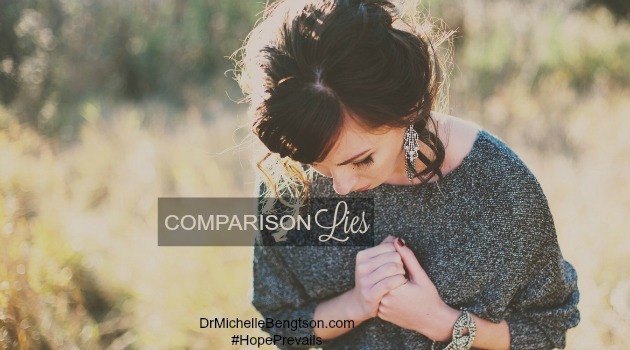 This topic is close to my heart because I also struggle with the comparison trap. I think as women we are prone to it. So my remedy has been dwelling in Ephesians chapter one and speaking its truth, to myself and to others whom I minister to. And, we need to remind one another of our worth. And that’s what your message did for me today. Thanks for that! !